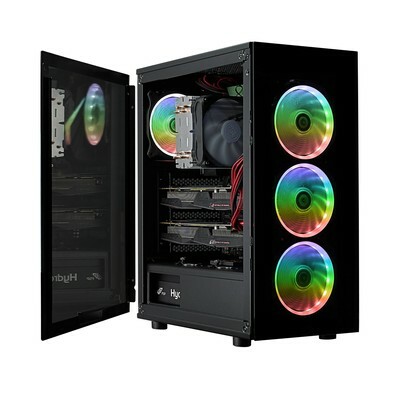 FSP is pleased to announce the availability of the CMT340 RGB PC Gaming case, the world's smallest mid-tower chassis that can fit a 360 mm radiator. With four amazing looking and addressable RGB fans and two galaxy dark tempered glass panels, the CMT340 is a beautiful proposition for gamers on a budget. The CMT340 is a compact version of the award-winning CMT510 ATX mid-tower but with several improvements. It features a gorgeous black coated, sturdy SPCC steel frame, which holds the same distinctive features and flexibility as the one in the CMT510. It supports a wide variety of radiators, ranging from 120/140/240/360, for liquid cooling, or air cooling fans. The CMT340's four RGB fans are fully addressable and compatible with Asus Aura Sync, and MSI Mystic Light Sync.